Social Loafing: WHO TO BLAME? Most of the time, the issue that causes students the most headaches and countless sleepless nights is of doing group assignments. Because it is not just about the difficulties of the group assignment in itself, it’s about choosing the SUITABLE GROUP MEMBERS for your group. 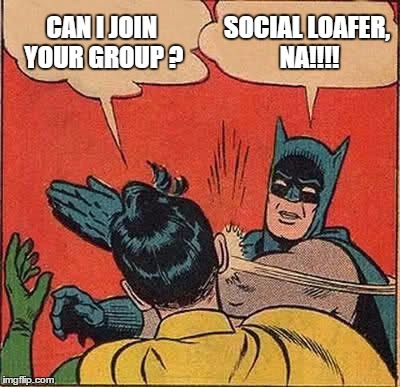 It’s because we are all afraid of having SOCIAL LOAFERS in our group. In Psychology, social loafing is a phenomenon of people investing less effort or no effort when working in a group when compared to working individually. To me (at least to me), social loafers are almost everywhere… I am a Psychology student and we learned about “Social Loafing” in the Social Psychology class. We were even taught how to reduce the occurrence of social loafing, yet we are sad to admit it’s not as easy as we think to reduce this effect in group work. So, what causes social loafing or more to the point, what environment cultivates the growth of social loafers? If there is a large number of group members in a group, individuals tend to feel that they can simply ‘hide in the crowd’ since their contribution doesn’t bring large impact to the group outcome and other contributions will take place too even though they do nothing. Also, they won’t affect the group outcome despite exerting less effort than others. Hence, having a smaller group size is better in reducing social loafing. In addition, diffusion of responsibility is likely to take place when their roles and responsibilities are not clearly defined, which thus results in a situation where they can avoid themselves from doing more. To tackle with this issue, Apple Company established its own culture of “DRI” (Directly Responsible Individuals), the name which often appears in the agenda of the meeting so that everyone is familiar who is responsible for certain aspect of the project. Individual Evaluation can reduce social loafing because individual performance will be addressed through peer evaluation where group members can evaluate each others anonymously. Yet, the subsequent action following individual evaluation needs to be taken seriously. I joined a class before in which peer evaluation was conducted right after the assignment was submitted, yet no action was taken subsequently and every member gets the same mark at the end of the day. In this way, individual evaluation loses its power and social loafer still enjoys similar results even though they never committed to doing anything in the group. One thing that needs to be mentioned is peer evaluation needs to be done anonymously. If the evaluation form requires name and ID, honest rating and comments might risk someone of losing his friendship or job. Research showed that people from Collectivistic cultures (eg: Asian) are less likely to show social loafing than people from Individualistic cultures (eg: United States) (Karau & Williams, 1993). It’s believed that people from Collectivistic cultures tend to value relationship and group goal more important than self interest. Reading up to here, you might question why social loafers are still prevalent around you even though you come from a Collectivistic society. It’s because the issue of social loafing is not restricted to certain cultural groups, it’s more related to the thinking (whether you are individualistic or collectivistic) because even individualistic Asian can show social loafing too (Christopher Earley, P.,1989). Sometimes, even though we know about these members who will definitely do less or even nothing in the group, we still allow them to join the group. One of the main reasons would be they are your ‘BEST FRIENDS’ (Hate it or not, we always have a friend who is a social loafer) who will take all costs to take advantages of this friendship for the sake of an “A+” for the group assignment. You might also find hard to ‘SAY NO’ to them because ‘Saying No’ is (often but not always) against the social norm (some cultures tend to say ‘Yes’ more than ‘No’). Another mitigating factor would be the ‘Fear of Rejection’ after rejecting others who want to join your group because you might present yourself as a bad person and people might start talking bad about you. With all these irritating factors, you have to say Yes and start another busy semester which you need to do everything yourself and everyone will take the same credit! There are few more factors which are left unmentioned in this article, yet I believe to our common sense, we roughly know why these kind of people continue to exist. Social loafing is a common phenomenon, it exists because we are all humans. It needs extra effort and courage to reduce it. Bear in mind that it’s not easy. Before I stop typing, just a food of thought: When we still have social loafers in the group, should we blame them for being inconsiderate and choose to become parasite in the group? Or we have to blame ourselves for sustaining a comfortable environment (poor implementation of policy, ambiguous individual roles) for them? Think about it. Have a pleasant day ahead! Posted in Psychology articles and tagged articles, books, psychology. Hailing from Sandakan, Sabah (The Land Below the Wind), Gary Yap has developed a keen interest in psychology and mental health issues ever since he was 15 years old. After receiving a Bachelor’s Degree of Psychology in HELP University, he volunteered at the Psychiatric Department of Duchess of Kent Hospital and worked as a para-counsellor at a private psychiatric clinic. He later completed his Master’s in Clinical Psychology at Universiti Kebangsaan Malaysia. During his training in becoming a clinical psychologist, Gary was professionally trained at the Health Psychology Clinic, Universiti Kebangsaan Malaysia; the Psychiatry Department, in Hospital Kajang; and the Psychiatry Department in Universiti Kebangsaan Malaysia Medical Centre. Gary is currently a clinical psychologist associate at SOLS Health and also the director of MY Psychology (Malaysia’s Leading Online Psychology Educational Platform) where he and his team utilized the strength of social media to increase psychological literacy and awareness about mental health issues in the public community. With the motto of “Learn . Share . Apply”, he is striving to build a society where psychology is for everyone.